Sepultura bro Andreas Kisser joins The Beatles on Mathew Street Wall of Fame, Getintothis’ Kate Forrester thrashes about with the crowds. A METAL legend was finally given his own brick in the Cavern Club’s wall of fame – but only after bosses discovered how famous he is. Dozens of South American music fans descended on Mathew Street to watch as Andreas Kisser, lead guiatrist for Brazilian outfit Sepultura, was added to the list of muscial heroes who have performed at the historic venue ahead of his performance at this weekend’s Mathew Street Festival. The guitarist behind the metal classics Chaos AD and Roots, who also celebrated his 44th birthday yesterday, dedicated the accolade to his wife, Patricia. 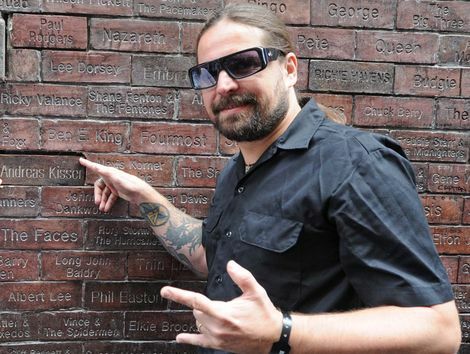 A space in the Mathew Street Wall of Fame is ready for Sepultura’s Andreas Kisser name to be inserted. Andreas has showcased his talents at the Cavern before, but it was only this year that club owner Bill Heckle realised how revered he and his band are among metal fans – and decided it was time to honour him in the traditonal way. 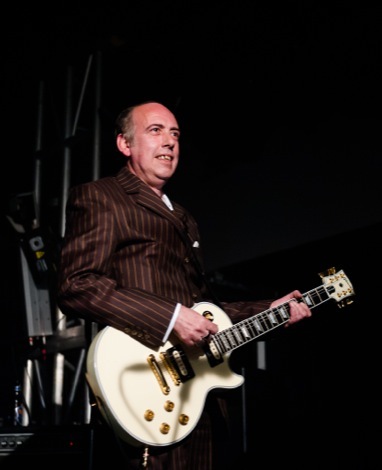 Bill said: ‘Andreas has played here before, including at last year’s festival, with the Clube Big Beatles tribute band. ‘But I just didn’t realise who he was and how big a name he is, until I found out he’s bringing two Brazilian TV documetary crews with him to this year’s festival. ‘I mentioned it to some other people and they were gobsmacked that I had never heard of Sepultura, but that area of music has never been something I’ve followed properly. 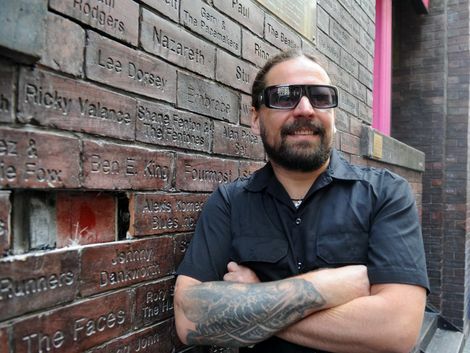 Fans watch on as Sepultura’s Andreas Kisser gets his name on the Mathew street Wall of fame. The brick was officially installed this morning, in front of crowds of fans who asked Andreas to pose for pictures with them. After the brick was presented, the throng of fans sang happy birthday to their idol in English and Brazilian. Andreas will perform with the Clube Big Beatles on the Williamson Square Stage at 2pm on Monday where his band will play The White Album in its entirety. But if you want to catch him in a more intimate setting head to Bem Brasil tonight for some meaty riffs alongside some seriously meaty delectable cuisine.